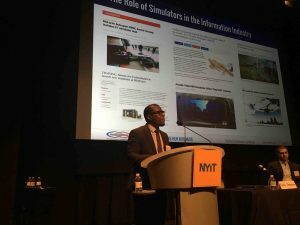 CEO Felix Thomas Brings Real World Cyber Security to NYIT | News & Resources | NSSPlus, Inc.
(Falls Church VA – September 27 2016) Network Security Systems Plus President, CEO, and Founder Mr. Felix A. Thomas recently returned to his alma mater the New York Institute of Technology (NYIT), to participate in NYIT’s Annual Cybersecurity Conference. Mr. Thomas delivered a presentation during the “Accelerating Cyber Education and Careers” session to an audience comprised of students, faculty and staff, and industry leading cybersecurity professionals. Mr. Thomas’ presentation titled “Careers in Cybersecurity: The Information Economy and Autonomous Evolution” gave an insiders perspective of cybersecurity, the state of cyber threats to the nation, and some of the action NSSPlus teams take to combat that daily threat. Mr. Thomas discussed the fundamental components of risk assessments, how to prioritize that risk and how organizations actually implement their risk management strategies. While providing a glimpse at the current state of affairs in cyber Mr. Thomas also took the audience into the future. He stated that by 2021 the cost of cybercrime will total some $6 trillion with an estimated shortage of cyber-professionals of 1.5 million by 2019. Mr. Thomas called it the largest human capital shortage in the world. View Mr. Thomas’ presentation here.